Mumbai : Singapore has received over 6 lakh visitors from India between January to May 2018, reporting a 17% year-on-year increase from 2017. The year 2017 was a record year for STB as visitor arrivals from India had crossed the 1 million mark for the third time in a row, showcasing the highest growth rate at 16% in comparison with all markets. India also continues to be the top source market for visitor arrivals in the cruise segment for Singapore. Last year, 127,000 cruise passengers from India sailed out of Singapore’s shores, showing a year-on-year increase of 25% from 2016. In 2017, the Singapore Tourism Board (STB) undertook several initiatives to deepen its position in India. These included its association with the Bollywood movie ‘Badrinath Ki Dulhania’, participation in cruise forums and travel trade events such as SATTE 2017, partnerships with airlines, launch of the Vegetarian Food Guide and unveiling of a new brand identity, Singapore: Passion made Possible, among others. Early this year, STB organised roadshows in Jaipur and Mumbai, participated in SATTE 2018 and organised a two-day Consumer Travel Fair in Bangalore to engage with Indian travellers. This year, the STB has lined up a series of collaborative initiatives to entice and welcome more Indian travellers to Singapore in 2018. They embarked on an 8-city roadshow, from July 16-26, with close to 40 stakeholders to connect and grow their partnership with in-market travel agents. The 8 cities were Trichy, Ludhiana, Kochi, Kolkata, Surat, Vizag, Coimbatore and Lucknow. 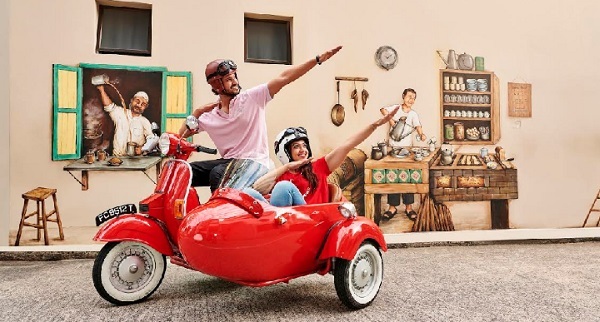 This is part of STB’s ongoing efforts to take the ‘Passion Made Possible’ brand messaging forward and showcase Singapore’s diverse offerings to the target audience- families with kids, early & established careers, cruise travellers, meetings and incentive groups. Themed, “With Passion, Forging New Possibilities”, the roadshows enable STB to present exciting, new offerings and familiar favourites to in-market travel agencies. Through the roadshows, STB plans to deepen its existing partnerships and foster new ones with the travel trade partners. Some of the new enhanced leisure offerings are - Maritime Experiential Museum, AJ Hackett Sentosa, Genting Dream, Singapore Sidecars tours, Rainforest Lumina at the Singapore Zoo, among others and upcoming events such as the Singapore Food Festival in July, Singapore Night Festival in August and Grand Prix Season Singapore in September. The roadshows include key stakeholders from Singapore representing hotels, airlines, integrated resorts, attractions, Destination Management Companies (DMC) and cruise operators. The delegation is being led by STB’s Mr. G.B Srithar, Regional Director (South Asia Middle East Africa), Mr. Adrian Kong, Area Director (South Asia - Mumbai), and Ms. Yuemin Li Misra, Area Director (North and East India). While speaking about STB’s efforts to showcase Singapore as a destination of choice among Indian travellers, GB Srithar said, “India has been a very important source market for Singapore and STB has been steadfastly engaging travellers through partnerships and various marketing initiatives. Last year, India moved up a spot to become the third largest source market for Singapore in terms of Visitor Arrivals."